My goodness, over 900 (as of Sept. 21st!) flutists have downloaded my "simplified" version of the Moyse Exercises Journalier so far. Egad! What a thrill to know that it's something flutey folk do indeed need! So glad to help! Thank you everyone for your wonderful comments, and supportive cheers! Download Part 3 (pg. 22-39) of the simplified version in pdf. You have to register (get password sent etc.) to see the first video. There's an introduction so far, with more videos to hopefully follow as his schedule permits. The intro-film takes a long while to load, so I recommend; go make your lunch and return 20 min. later, to play the video after it's fully loaded. Also, here's a very up-to-date Galway interview online, for free listening. Apparently Sir James is planning to make teaching films from home. Excellent news! Listen to four-part radio inteview with Sir James. 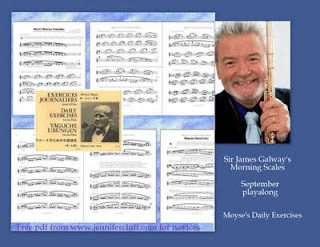 I'm sure that by the time all the novices and intermediates finish my almost 40 pages of exercises at the end of thirty days, they will be zippy, fleet-fingered, gorgeous tone-meisters, and be able to walk away from the music stand and create their own "Journaliers"! Happy freedom to explore to all! Return to part 1 of this topic, and download Part 1 (pg 1-9)of the Moyse E.J. book simplified.